Time never slows down or stops for anyone. Follow the pace and get things done and that's the way to go rather than waiting for the next opportunity. It's good to reflect back once now and then to check the accomplishment list and analyze if time was utilized wisely. Yeah, these are all well known facts, and we might have heard it over thousand times in our day to day life from our childhood, but putting them into practice is the hard part. Getting organized and having a routine is a better way to utilize the time. Yes summer time is less organized for me; it affects everything other than my work. Getting back to the schedule was a bit hard, but I am there now. Beginning of Summer I planned to post few salad recipe as it was the apt time to do so. There were few which caught my attention from the cook books. But the right time never came...its easy to blame on time. I had this recipe sitting in my folder for few months now and finally I made this refreshing salad yesterday and we really enjoyed it as a dessert after dinner rather than a starter. Toast the sesame seeds in a pan for 3 minutes. 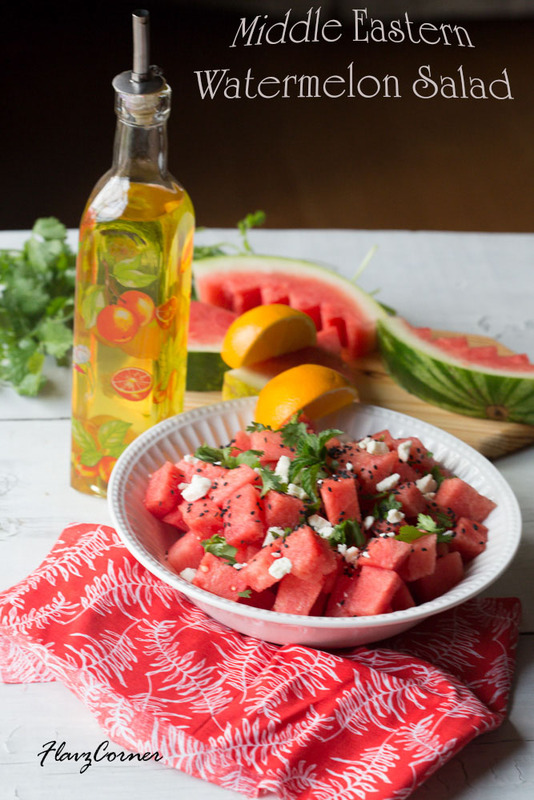 Place the cubed watermelon and feta on a plate. 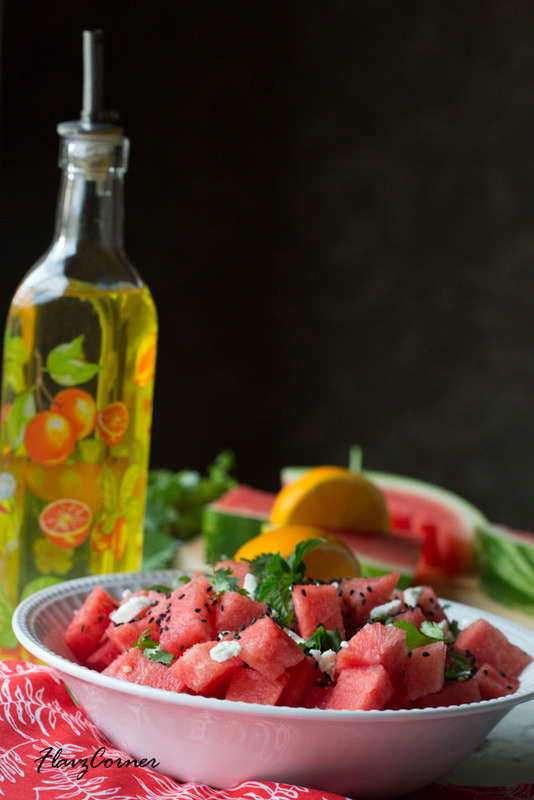 Sprinkle the toasted sesame seeds, Cilantro and Mint leaves on the watermelon. Just before serving the salad, drizzle the Orange juice and Olive Oil on top of the salad. Season with fresh cracked black pepper. The original recipe called for fresh pomegranate seeds too, I didn't have it when I made it, but still it tasted good. Add the orange juice and Olive oil only before serving, otherwise the salad will turn watery. 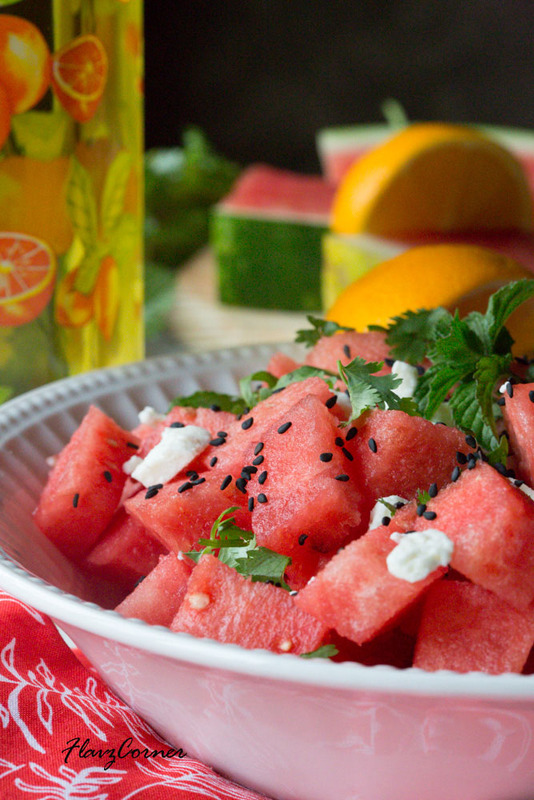 We love watermelon salad this time of the year -- so refreshing! Love the use of orange juice. Is it 1/2 cup? Kiran, its half a navel orange I used. Nice pics Shibi and what a refreshing salad..I love fruity salads... :) BTW - I just bought the same wooden board yesterday - LOL!! Thanks Nusrat for visiting my space!! 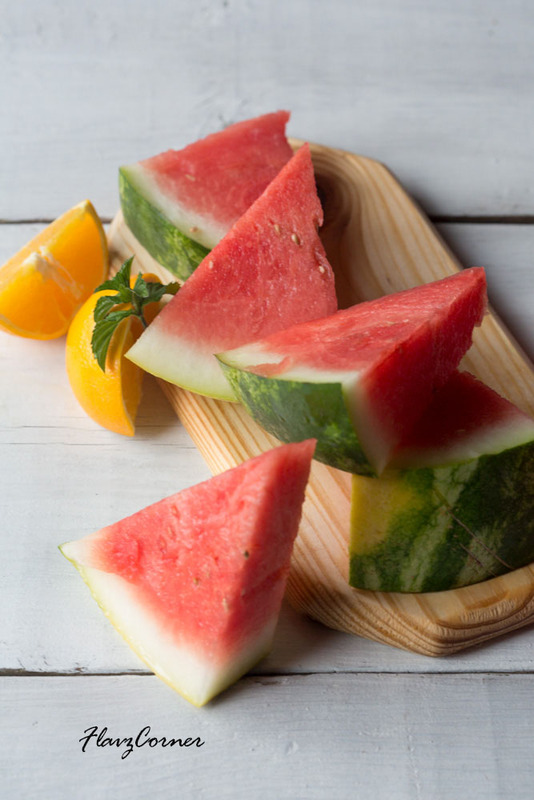 I have watermelon for breakfast almost every morning in the summer, but rarely use it in a salad. I need to correct that! This looks wonderful. Love the idea of toasted sesame seeds in it. Good stuff - thanks.